A family sabbatical year in locations such as Nice is possible. In this down economy, it may seem crazy to suggest pursuing your dream to take a family travel sabbatical. I think people mistakenly think that only the wealthy travel for months on end, or live overseas in desirable or seemingly unreachable locales. I am here to tell you that I was but a modest, badly-paid journalist who, at the tail end of the last economic bust in 2003, decided to leave a secure newspaper job of five years and live in France. We had no savings. We had no wealth. We had a baby who needed diapers and baby food. But we did come to realize that, in many ways, un-tethering ourselves from our deep-rooted lives was actually a frugal move. In the end, we were able to pull together enough money to live several months in France. The first move if you want to experience a family sabbatical, especially when times are tough, is to sort through your goals, your expectations, and what you are willing to give up. While there are immense rewards, they do come at the cost of some sacrifice. The best way to make it work in a bad economy is to decide what you are willing to erase from your life. The bonus of something as drastic as a family sabbatical is you free yourself from many costly responsibilities and encumbrances. In doing so, you both save yourself money and bring in money. For example, we sold our house (our equity made up a big chunk of the money we used to live overseas), but you could certainly rent out your house and even tap into equity by refinancing. You could look into a Home Exchange program that can prove quite frugal. We sold both of our cars, which brought us cash and eliminated payments. We eliminated quite a number of bills, including all utility bills, insurance bills (even health insurance overseas was dramatically less expensive than American insurance). We sold or gave away most of our furniture. Everything we owned literally fit into my childhood bedroom at my father’s house. It was actually quite liberating (in fact, I frequently wondered why we even had so much stuff. You quickly realize what is truly important to keep while going through this process). You also should be prepared for people to think that you are insane, and to develop some sane responses. For most people, working a 9-to-5 job from college until retirement or death is the norm. We found that people not only tried to talk us out of it, but would even get angry at the idea. Be ready to respectfully disagree or just end conversations with people like this. I had literally spent several months sending resumes to newspapers, only to hear they were laying reporters off or experiencing a hiring freeze. My husband was in a job that made him miserable. He was only able to see our daughter for the couple of grumpy hours she was awake after he got home. It got to a point where it seemed like there was no room to move forward, and little else to lose. If you are in a dead-end job or you simply don’t have a job, a family sabbatical can prove to be a golden opportunity. There are plenty of freelance jobs and businesses that can be run from anywhere in the world, particularly in the modern global economy. You can take advantage of these opportunities, in fact. If you can arrange to be paid by clients in a country where the currency is high against your home country’s currency, it comes out to be the equivalent of getting a large pay raise. The other thing to consider is that sometimes it is easier to get a visa to stay (and even work part-time) in a country if you elect to return to school. If that is something of interest, you may return home after the experience better positioned in the job market. The crucial thing is to determine your budget, and be very conservative when estimating how well it will last. If you have (or might) get laid off, you have less to lose. If you are job hunting, you are currently competing with far more candidates than you are in an up economy. If the bad economy is global, you can specifically look to move to a country where your home currency is strong. You can eliminate a great many debts and financial demands by leaving your home country and either going mobile or living more simply. All of the above really helps very little if you make your large financial moves, you sell off your valuables, and you then choose an expensive place to live that taps all your resources. The biggest decision you will make is where to live. We chose Nice. We absolutely loved Nice (and it was certainly cheaper than Paris). Still, on many occasions when we traveled to smaller European cities and villages, my husband and I commented that it would have been wiser to pick a less popular destination. If I have one regret reflecting upon our sabbatical, I would say that our picking a more expensive city for the whole time in France is probably it. Even several other big and wonderful cities in France – Montpellier, Toulouse, and Bordeaux – would have probably allowed us to stay weeks longer. 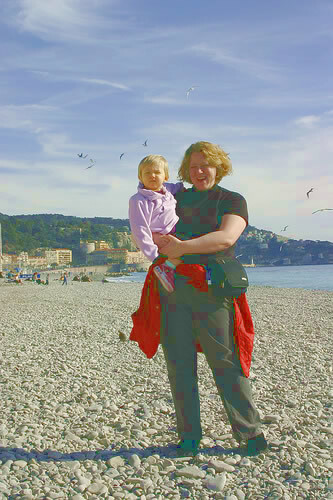 We also made several decisions to accept a simpler life while in Nice. We had a small apartment while opting for a central location. We never bought a car (saving hundreds monthly in payment, gas, and insurance), but use a long-term lease buyback rental for a lengthy road trip. On that road trip, we camped almost the whole time. We rarely ate at expensive restaurants, but instead shopped at local markets and made our own great food. When we splurged, it was on 2-euro pastries. In the end, we shaved hundreds off our monthly expenses, but strong euro versus the dollar made it difficult to stay. Returning to the States was not easy. We had to start our lives over, literally, from scratch, trying to buy a car with no job, trying to land new jobs. The funny thing was, when we returned, the U.S. economy was back on track. I was turning away job offers. What a difference a year of travel had made. In our first apartment, upon our return, we had not even moved a small amount of furniture we had stored, so we used bean bags for chairs, a box for a TV stand, watched a 13-inch TV, and all three of us slept on air mattresses. We felt a bit like strangers in a strange land, not quite at home in Europe and not quite at home in the States. We relocated again to a place that reminded us of Europe in the States. It was not an easy road. But there has never been a moment when I regretted a single sacrifice. I consider our family sabbatical as the single most wonderful experience in my life. HomeExchange.com is a fine resource for exchanging homes overseas. There is a paid membership. Editor's note: Transitions Abroad offers a comprehensive listing of home exchange sites and first-hand reports. Autoeurope Lease Buyback Program offers a way to have extended use of a car for traveling around Europe without the peskiness and expense of moving your car overseas or buying a car there. We personally used this program. Creating a budget to move abroad, even if you cringe at the thought, is crucial before making a such decisions. No, you can’t foresee everything, but you can get an idea whether and how to make your family sabbatical dream a reality. There are tons of online resources for doing so, and I suggest creating a budget given your current situation and another scenario with your proposed family sabbatical situation. You might be surprised which one has a fatter bottom line. Kelby Hartson Carr is a travel writer with more than 15 years of experience. She lived in France for a year, and traveled extensively around Europe.